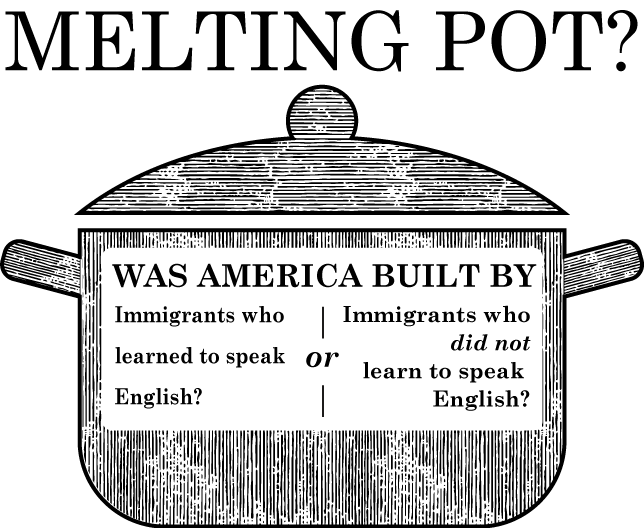 Melting Pot? - Was America Built By (A) Immigrants who learned to speak English? Or, (B) Immigrants who did not learn to speak English? (4) don't develop personal relationships with other Americans? Are you really part of America's Melting Pot if you don't speak English and only interact in a separate community that only speaks a foreign language? Note 1: China has had many different languages in its past only to realize that for it to progress (and also avoid civil wars), it must center on a single language, both spoken and written. Note 2: The American Indian also had many different languages with at least 500 different tribes being recognized today. However, the American Indian never did center around a single language and was always fighting against each other. To use the term, " American Indian" would not be a correct term to describe them all as they all had many differences with each other regarding language and culture and hence were always destroying each other.